If you are here to register for my Christmas giveaway, scroll down two entries to last Friday's post. There is still time to play! I have to laugh at myself. As this is the first time I have ever done a giveaway, and I know I've gotten a lot more traffic here than usual, I seem to have suddenly found myself tongue-tied! There are definitely not a lot of profound thoughts in my brain searching for expression today. But it could also be related to the fact that this pregnancy insomnia thing is really kicking me in the...whatever. I feel like a zombie, and don't even have a baby yet to show for it! This morning I got Boo and Daddy ready and out the door in record time, and didn't even wait for their departure before going back to bed for another two hours. Thus the day fractured before it even began. The intent was to go to the grocery, then meet Boo for lunch at school, then come home and do something productive. After sleeping in, it was already Boo's lunchtime by the time I got my shopping list made. So Rooster and I met her first, with a modified plan to continue on with the grocery shopping in the afternoon. We ended up acquiring Boo for the rest of the day, as I took pity on her request to leave school early. What was I thinking? I can barely walk through the store with my eyes open, let alone navigate sibling issues today! But I thought that with her along, we could also stop quickly by Hobby Lobby to get supplies to make a gift for her classmates. An HOUR later, we were on to the next quick stop at Sam's Club for 8 items. I was still hungry, so decided we (I) needed some cheap pizza from Sam's Fine Deli. So another HOUR after that, we were finally ready for the Kroger part of the trip. Oh, forget it. I'll just go tonight on the way home after a Christmas party. 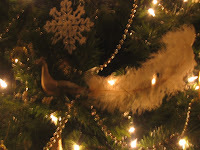 We came home and started making ornaments, which lasted... longer than the kids did. I ended up finishing the ones the kids had started, then thought I might have a few minutes of quiet time. Hah! Rooster proceeded to produce his THIRD poop of the day on the potty, which led me to suggest he take a bath. Of course, once he had one, Boo wanted one too. Rooster stayed naked in the bathroom to participate from the dry side of the tub. I have a good view into the bathroom from my computer chair, so felt I was doing well to supervise from here. Next thing I knew, I looked over in time to see...my little man cub PEEING into Miss Boo's bath! Oh.My.Word. Bathtime over! Now my little angels are running through the house "nekked." Rooster is wearing a hooded cape, Boo is wearing a horse. You know the one, you stand in the middle of a giant stuffed horse, and it stays on your shoulders via suspenders? That one. But underneath the accessories, it's all baby skin and parts showing. I am going to be laughing for the rest of the day!!!!!!!!! Only because I have a five and three year old and you describe my life 24/7. Bless you for having a third. We started out wanting four. We stopped at two! Thank you for stopping by my blog. I am so glad you did. I would be very honored to be listed on your "of possible interet" list. I post M-W-F. I hope to see you there. And, I will definitely be back here. I am still laughing!